I’ve been working on ideas for what to post on Friday every week, so the week doesn’t feel totally off-balance (Spacetrawler takes a LOT of work, and would probably kill me to do a third one per week unless I dropped most of my freelance). 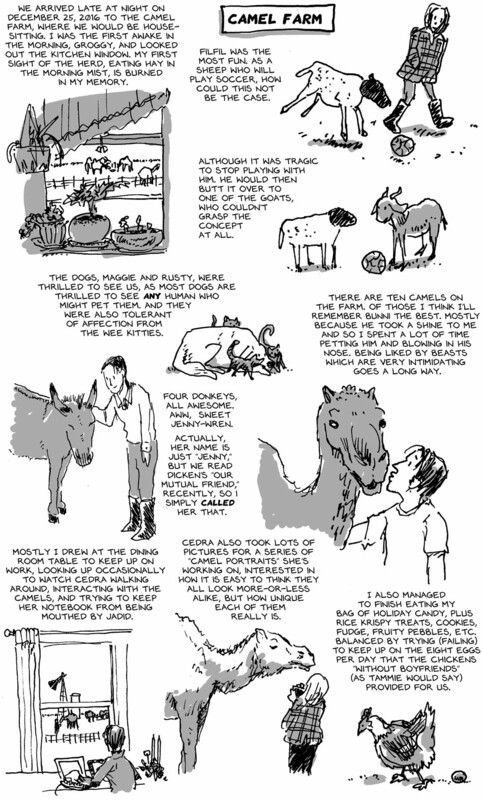 And this week, staying at this camel farm in Texas, the “Texas Camel Corp,” inspired me to revive the diary comics. And so, for now, i’m going to try to post one every Friday. We’ll see how this goes. My parents can see sheep across the other side of the valley. They are “formation sheep” in that they move in straight lines across the fields, or circle round the trees, or make arrows on be hillsides. Occasionally they all run from one side to the other like and I sing the “Chariots of Fire” music as they do it. Today they broke into someone’s garden and bothered their horse, so they are also stealth sheep or maybe special forces sheep. Damnit. now I regret moving into a big city where I don’t have an opportunity to pet any animals (dogs and cats excluded) anymore. Our hens think I’m their boyfriend, but I’m keeping it Platonic for now. Most of us feel our best in Nature, the wilds of grass, undergrowth, trees, insects other arthropods and animals of all kids. We just aren’t use to it and can’t tolerate it for long. But we still have yearnings for it anyway. It’s true. Vegetarian still, and not a lot of dairy (out of circumstantial situations), but not currently vegan. Would the neighbors (who would usually stop in for some eggs) be avoiding these strangers/interlopers/guests/farm-sitters, out of shyness or something else? How do the usual occupants manage the egg excess? Large family? Awww…. always loved donkeys. And goats. Sheep, dogs, cats, getting to meet camels.. You were in HEAVEN. It sure sounds lovely. You sure know how to make memories. Hey, Happy New Year! Happy New Year! I hadn’t realized this strip was only a year old – so much has happened in my life at the same time.